Golf in Cardiff has come into its own ever since the famous 2010 Ryder Cup at Celtic Manor and continues to go from strength to strength. Celtic Manor, with its 3 championship golf courses and 5* hotel, is the obvious choice - but there are plenty of golf courses in the surrounding area that compliment it nicely. The likes of Cottrell Park, Radyr & Whitchurch all offer testing golf for players of all ability just outside the city centre. 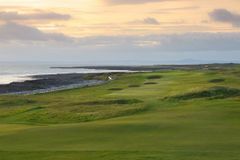 Golfers looking further afield should make sure to visit Royal Porthcawl & Pyle & Kenfig as both rank within the top 10 golf courses in Wales. For those looking to stay right in the city centre, look no further than the Mercure Holland House Cardiff. Located between University & the Millennium Stadium it's right in the hub of the main bars & restaurants of Cardiff. Those wanting an outskirts of the city hotel, the Copthorne Hotel Cardiff is the obvious choice. Comfortable, stylish and in close proximity to the main course its a good base for your Cardiff Tour. Great golf and extremely lively nightlife are guaranteed in the Welsh capital, where a golf tour is the perfect balance of work and play. To plan your perfect tour speak to our dedicated Cardiff specialists.